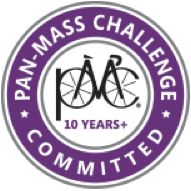 This is the 35th annual PMC, our 15th PMC, and the 10th(!) 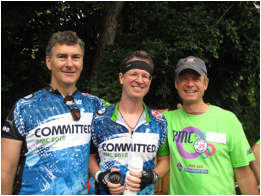 anniversary of Carl and David’s extended 1,000-mile PMC from Cincinnati. In spite of the various obligations that life brings (for instance, we had two kids among us when we started in 2000 and now we have six), we remain committed to this exceptional cause and we ask for your support. The Dana-Farber Cancer Institute is one of America’s finest cancer research and care centers (repeatedly ranked in the top 5 by US News and World Report for cancer care, and four-star ranked by Charity Navigator for its efficiency with your contributions), and your gift allows Dana-Farber to do cutting edge work in the field. This year Carl rode from Stockbridge to Sturbridge on the Friday and volunteered with his family at the Nickerson State Park waterstop in Brewster Sunday morning, while David and Mike rode the traditional 190-mile PMC from Sturbridge to Provincetown over Saturday and Sunday. As it worked out, Saturday was the coldest sustained rain in the history of the event, but we persevered as we must. When you remind yourself that this is nothing compared to a course of chemotherapy, you just get it done. With the support of our generous donors, over the past 15 years we’ve raised over $400,000 for the Dana-Farber Cancer Institute’s Jimmy Fund.